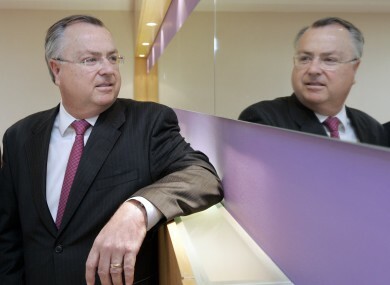 IBRC chief Mike Aynsley looking at himself in the mirror at a Chartered Accountants Luncheon last year. SIX CURRENT EXECUTIVES at the former Anglo Irish Bank earn over €500,000 a year it has emerged, despite the government’s cap on remuneration packages for bankers being set at half-a-million euro. Figures released in a parliamentary question to Finance Minister Michael Noonan this week disclose the remuneration to staff at the bank – estimated to have cost the taxpayer in the region of €30 billion – which is now known as Irish Bank Resolution Corporation. Noonan said the figures included pension payments, allowances and benefits paid to staff. The six executives who are on in excess of €500,000 when pensions, allowances, and benefits are taken into account have been named in today’s Irish Times. They are chief executive Mike Aynsley, chief financial Jim Bradley, head of asset recoveries Tom Hunersen, head of Irish recoveries Mark Layther, head of specialised asset management Richard Woodhouse and head of UK operations Jim Brydie. The figures, disclosed to Fianna Fáil’s finance spokesperson Michael McGrath, also show that 12 staff are on packages of between €300,000 and €399,000, 24 staff are on between €200,000 -€299,000, 44 are on €150,000 – €199,000. The majority of staff are on packages of up to €149,000 with the figures disclosing that 774 are on up to €99,000 and 146 are on €100,000 to €149,000. The current government has imposed regulations which mean that entire remuneration packages cannot exceed €500,000 but under old rules salaries could be €500,000 and bankers could receive additional packages by other means. This has meant that Aynsley, who was hired three years ago, has a base salary of €500,000 as well as an allowance of €38,000 and a pension of €125,000. Speaking to Newstalk last week, the chairman of IBRC, Alan Dukes, said that Aynsley’s package was appropriate. “That was the kind of money we had to pay at that time to attract in a person who could do the job,” he told the station. Email “Six execs at former Anglo Irish Bank earn over €500k a year”. Feedback on “Six execs at former Anglo Irish Bank earn over €500k a year”.